Well really, this is getting silly. Where's the low season? This week has been almost all sun, hardly any wind. There was a few minutes of light rain on Tuesday afternoon, a quick 15 minute burst of wind and rain on Wednesday morning - I was at home, and the wind suddenly picked up, all the hills were obscured by clouds scudding in from the west... 20 minutes later it was all sunny again. It's hot too. Temperatures in the mid 30's Celcius. Although June 21st was the longest day, the sunset time actually gets slightly later, and will be around 6:48pm for the next few weeks. The sun rises a bit later, which I notice, since we tend to wake up around 6am. In the summer, we wake up and it's just about light. In the winter, it's still dark (sunrise in January is as late as 6:46am). These long summer evenings are great. Just that extra half hour of sun means I get home from work with the sun still up, have time to relax outside, kick a ball around with the boy, maybe take a walk at the reservoir or go for a swim at the local pool. I like this time of year! 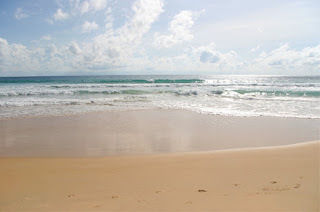 Yesterday afternoon I took a quick walk on Karon Beach. Not many tourists, red flags flying, waves not too big, but not ideal for swimming for sure. I saw one guy ignore the flags, head into the surf with his mask and fins... there were some lifeguards a bit further down the beach and they shouted at him. 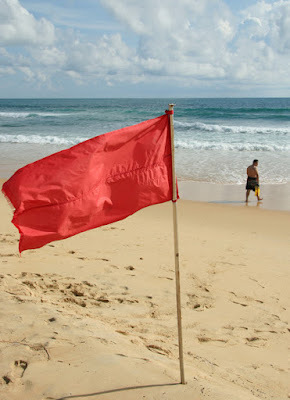 "Hey, red flags are not some kind of Chinese-Thai beach decoration". I was expecting to see a lot more garbage on the beach, as the waves and westerly winds always deposits flotsam on our beaches during the summer. There was a bit, but there won't be too much to clean up next week. On July 2nd there's a clean up at all Phuket beaches. Everyone welcome! Hey, nice flag! Think I'll go for a paddle.